The first thing to understand about Niloak Mission Swirl is that it was never advertised as Mission Swirl by Niloak. 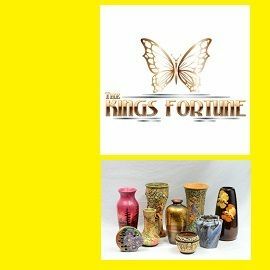 That name came about in the 1970's, a name applied by antique dealers to spur sales. 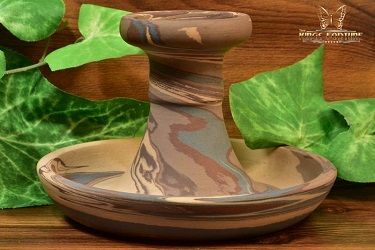 It was originally offered by the Eagle Pottery Company as "Niloak", the word they invented to describe the line of swirl pottery they manufactured and marketed ("Kaolin" spelled backwards). 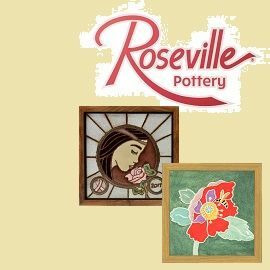 Just as Roseville sold "Pine Cone", or Peters and Reed sold "Moss Aztec", Eagle Pottery sold "Niloak". 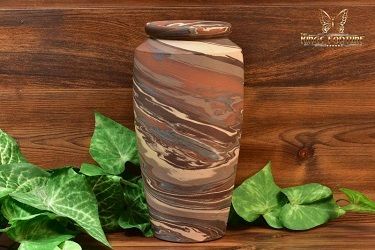 Niloak was sometimes referred to as "Mission Style Pottery" in magazine articles of the day, which undoubtedly gave rise to the "Mission Swirl" moniker decades later. 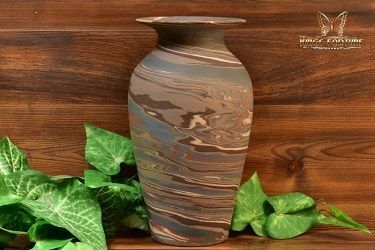 Eventually a Niloak Pottery Company was created, and that company produced not only Niloak (swirl), but Hywood by Niloak and Niloak branded castware. Eventually the term Niloak was no longer restricted to the swirl products. 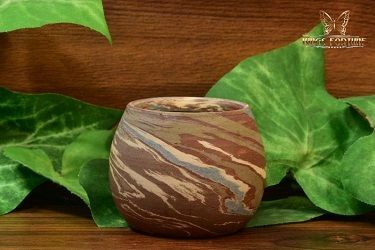 It is for this reason that most collectors and dealers refer to the Niloak swirl pottery as "Mission Swirl". While not technically a historically accurate name, it certainly has gained nearly universal use today. 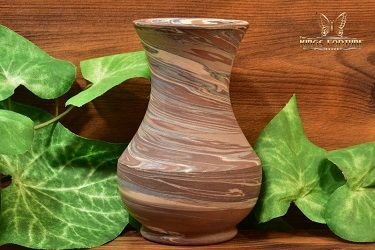 The second interesting point is that Eagle was not the first to produce swirl pottery. 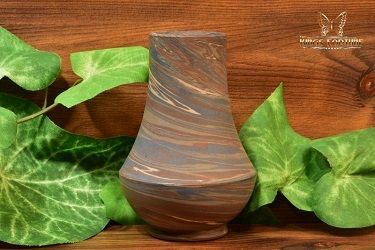 The technique had been known for centuries in Japan as Neriage and Nerikomi, the process of using multiple colors of clay to produce a single vessel. 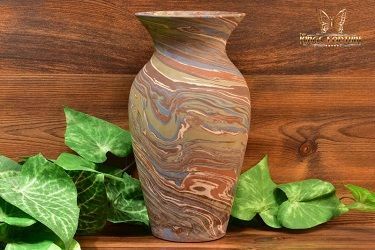 The problem had always been that various colored clays expand and shrink at different rates when fired, causing them to split apart, and often crumble or shatter. This problem was apparently first solved in 1906 by the Ouachita Pottery, a company located 30 miles away from Benton in Hot Springs. 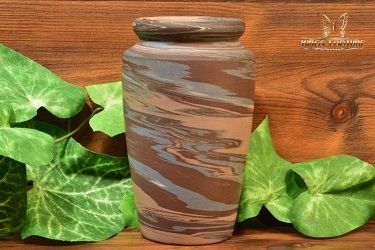 They found through experimentation that adding certain amounts of ground flint to precisely formulated colored clays could match their firing rates, allowing them all to be used simultaneously in a single vessel. 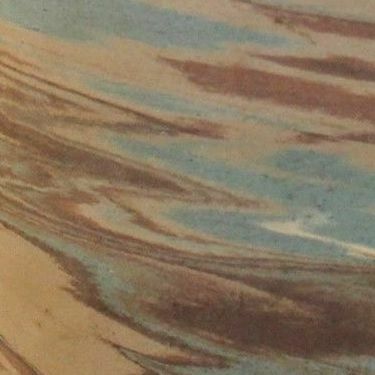 It is known that the Ouachita Pottery created a limited amount of multicolored swirl pottery well before Eagle. But is was Eagle who made it famous and popular through their Niloak line beginning in 1910. 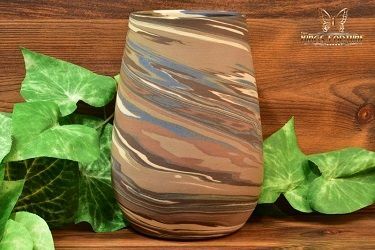 It is interesting to note that the swirl pottery represented an entirely new category of art pottery at the time. 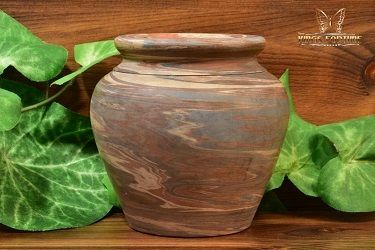 Niloak was not decorated, not carved, without interesting glazes, and produced in forms which were plain in their simplicity. 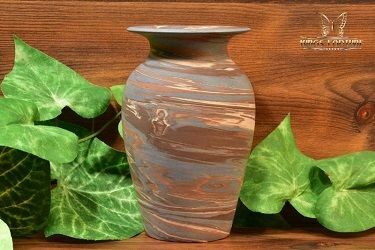 The decorative and artistic value was derived merely from the interaction of the different colored clays. The process for the creation of mission swirl required a combination of several pottery disciples. 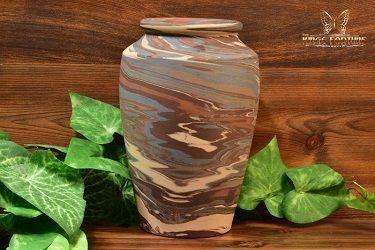 The process began with the chemistry, creating the formulas for multiple clay colors that could be fired together without danger. We do know that Niloak used six colors. Those colors are Cream, Gray, Brown, Red, White, and Blue. These six colors could be additionally manipulated by the firing process to provide a wider variety of shades. Other imitators often included green, but no authentic Niloak has been found including any green inclusions. Bright yellows and oranges have been seen in others as well, but not in Niloak. The various clay batches were stacked and pressed into a holding mold. 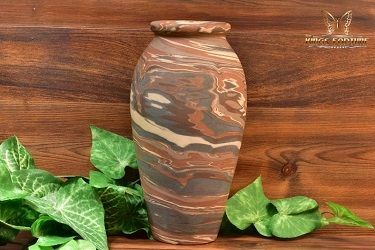 By modifying the thickness of the levels and the colors of the clays chosen the character of a batch of vases could be somewhat controlled. It was then cut into smaller chucks by piano-wire. These chunks were then placed on vertical lathes with attached jigs to form them into the vessels. They were then finished and smoothed with soft wet leather cloth. Finally, the interior was glazed and the vessels were fired in the kilns. The exteriors were normlly unglazed, and sometimes sanded with fine emory cloth after firing. 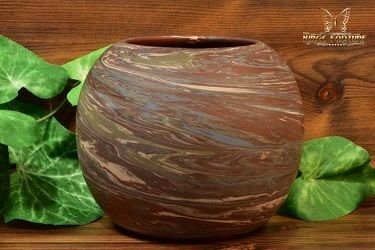 There were several companies which produced swirl pottery even as Niloak obtained a patent (In 1928 patent #1,657,997 was issued) for the process. 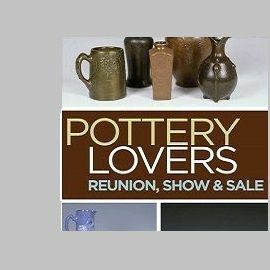 The most commonly found are Badlands Pottery (1934-1937), Evans Pottery / Desert Sands (1928 - 1960's), Denver White Pottery (1921- 1928), Ozark Pottery (1925-1928), and the Silver Springs Pottery (Seminole Indians, 1960's and 1970's). 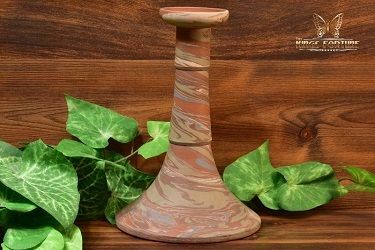 Below are some images of authentic Niloak Pottery Mission Swirl to help familiarize collectors with the typical forms and designs.